In this video, Mattie talks about what's going on in the world of crypto and blockchain technology. This is a daily segment! Announcing a new way to spend your Coinbase crypto — e-gift cards! Previous Post:IS WAX ICO The Next Big ICO? Tron buying BitTorrent is huge. Remember trons goal is decentralized the Internet! Twitter, Facebook and Amazon uses BitTorrent technology on their Backend!! Now Tron owns that technology. 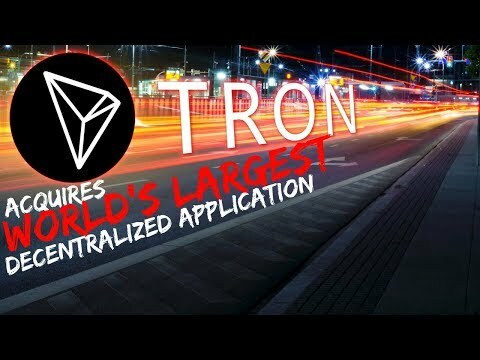 Tron is buying what makes the Internet… the Internet! GREAT! Finally Tron trx has some type of news! Maybe TRX wants to set up a paywall on Utorrent , You need TRX coins to pay for use of Utorrent? Almost my thought. I don’t think paywall though, but more like a pay-bump. So that you can pay just a tiny bit to get faster (ealier?) download and also getting paid to seed old content that otherwise would not be seeded. I’ve suggested a torrent client with the IOTA protocol for this reason. Can’t wait to see what Justin does with Bit Torrent. nah, TRON white paper says they want the internet to be what it was created to be, they might just put a permanent TRON ad there in the corner to get crypto awareness, TRON Foundation is not the kind of organization to force you to do something while holding what you want to do hostage. TRX and Bittorrent is old news and why the hell doesn’t CB work with Gifto?????????? TRON & Bittorrent – no more free movie downloads – once your torrent download completes they automatically deduct from your wallet – chaching… “David” might have just centralized the big decentralized “Goliath” after all. Hey Mattie! Great video as always. I’m sitting on a TON of TRX so it’s great always great to hear that the team is moving forward. I do have a question however, are you familiar with the project” TKY” The Key? I’ve fallen deeply in love with it and would like to know your opinion on it. Not going to lie, Bittorrent being part of Tron sounds pretty good. Just need some more information to see how much impact it’s gonna have on Trons vision. Coinbase is not the first platform to provide gift cards…Quadrigacx is already doing it for couple months now. Glad google added LTC. It deserves it. I’d understand paying TRX for official downloads e.g. a movie from Warner Bros. I don’t think they will kill BitTorrent by charging TRX for downloads but they will lose a lot of customers , like if they don’t have / know anything about Tron / TRX and they use bitorrent – now all of a sudden they have to get this TRX thing to download. What you suggest is better. Something like a small priority / advantage for TRX , or use Tron power. Would be cool if we could sell Tron power for TRX as part of the eco-system too. Or earn for seeding. He’ll announce an announcement to announce what he’ll eventually announce about what he’s going to do. can’t say I’ve heard of it – what’s the elevator pitch? Well, it’s an identity verification technology (IDV) being developed to create secure digital identities and uses blockchain based dynamic multidimensional identification to store big data. HERE’S THE KICKER!! Its already in usage and has been FULLY endorsed by the Chinese government! Check it out if you ever get any down time. Thanks mate, Great video TRX is indeed a Great coin, After Long it is back in news, Just in love with your Videos man, well I am also holding Kakushin.tech (KKN) which imo is having great prospects for growth! Tron needs to team up with Ripple XRP to make a mega move in the crypto world!